A New Map of Asia drawn from the latest Discoveries. 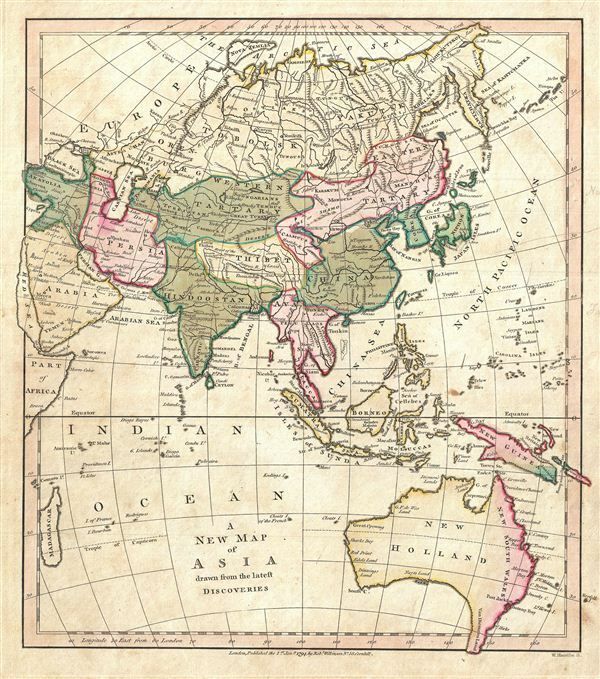 A finely detailed first edition 1794 map of Asia and Australia by Robert Wilkinson. Wilkinson's map covers from the Russian Arctic to the Indian Ocean and from Madagascar to New South Wales and New Guinea. Here Asia is divided into various geographical and political zones, including Arabia, Hindoostan (India), Southeast Asia, China, Persia, and Tibet, and the Tartaries. Though much of Central Asia was, for all intent and purposes, unknown to europeans of the late 18th century, Wilkinson derives his boundaries from antiquated histories relating to the breakup of the Mongol empire. These follow the a model that would soon be codified by John Winterbotham in his 1795 treatise A Historical, Geographical and Philosophical View of the Chinese empire which includes Tibet as part of eastern Tartary – those non-Chinese states to the west and east of the China proper owing, to varying degrees, allegiance to China. Winterbotham drew his distinctions from some of the old borders created following the breakup of the Mongol empire. Under Kublai Kahn, who ruled from China as a mostly Chinese emperor, Tibet was, though not China, clearly under Chinese vs. Central Asian Mongol control. In 1792, just two years before this map was issued, the Qing emperor sent a vast Chinese army into Tibet to discourage Nepali incursions into the region. To the south, Australia is identified as New Holland, with the english colonies along the east coast, established in 1788, being identified with red color coding as NewSouth Wales. Tasmania, or Van Dieman's Land, is clearly attached to the mainland. It would not be until 1798, four years after Wilkinson drew this map, that Matthew Flinders and George Bass would prove conclusively Tasmania's insularity. The disputed sea between Japan and Korea is here labeled the 'Gulf of Korea.' Some early maps identify this sea as the 'Sea of Japan' and the two nations have consequently been disputing the 'official' name ever since. engraved by Thomas Condar for the 1794 first edition of Robert Wilkinson's General Atlas.